So inspiring to read the history of Patagonia, the outdoor apparel company. The book’s title refers to the founder’s conviction that his people should spend time outdoors, as wilderness explorers and protectors, as users and inventors of Patagonia products. In January 2016, Patagonia hosted a meeting for Dutch B Corps at their European headquarters in Amsterdam. Over drinks I talked to Patagonia’s Director of Environmental Strategy Jill Dumain and their Environment & Social Initiatives Manager Mihela Hladin. As Patagonia featured as a case in my book Activists Dare to Care, I gave them both a copy. In return I received Let my people go surfing and The responsible company, written by Patagonia’s founder Yvon Chouinard. I started “surfing” on a recent family trip, and could not put it down. The first section about the company’s history read like an adventure novel, rather than a business book. What’s so inspiring about it, is the story of finding the company’s “why“. When Patagonia’s founder Yvon Chouinard realized that the climbing tools he was making were damaging the very rocks that were so precious to him, he developed pitons that were better for both the rocks and the climbers. At that time, he also started to build his clothing business. From the start, he sought a balance between durability to serve the climbers’ needs and responsible sourcing. Most business books are quite polished and focus on achievements. 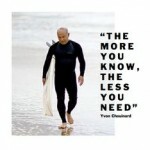 Yvon Chouinard’s voice and perspective is what makes this book so different. He never intended to be a businessman, he just wanted to make enough money – and the right gear – to support his wilderness adventures. He learnt the ropes of climbing and of doing business out in the field, rather than from the books. This book covers not only the highlights, but also the fears, the mishaps and the struggles of building a company with a real mission: build the best product, cause no unnecessary harm, use business to inspire and implement solutions to the environmental crisis. The second half of the book is more like a business book, as it outlines eight philosophies on how Patagonia runs their business. These are unique to Patagonia, linked to its mission and its values, but can definitely be used as inspiration for other companies. I found the product philosophy especially inspiring, balancing design with customer needs and production impact. Key elements in the product philosophy are functionality, durability, simplicity, easy care, combined with a relentless focus on customer needs and awareness of the impact each product has in production, use and disposal. In many of the philosophies, the power of long term, sustainable relationships is highlighted. This stretches from suppliers to retail partners, and from employees to partnerships with like-minded companies and people. It even pervades the promise made to the people who buy and use Patagonia’s outdoor gear. Their products are designed for long term use and therefore guaranteed, you can always send things back for repair or replacement. In the Image Philosophy chapter, Yvon Chouinard says: “Patagonia’s image is a human voice. It expresses the joy of people who love the world, who are passionate about their beliefs, and who want to influence the future.” Clearly, the future Patagonia wants to influence is one with plenty of room for nature, for climbing and for surfing. For their own benefit – as the people who work for Patagonia are all outdoor enthusiasts – and beyond. Patagonia’s marketing does not just feature the products, but is centered around the deep appreciation for nature and the commitment to help solve the environmental crisis. 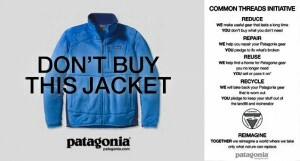 In 2011, at the height of the shopping season, Patagonia ran its iconic “don’t buy this jacket” ad campaign to raise awareness of how consumerism had gone overboard, urging people to think twice about buying new clothes and the impact this has on the environment. And while the header of the ad may suggest otherwise, taking such a strong stand grew their business tremendously. I found the story of Patagonia very inspiring and would really recommend this book if you’re interested in how to integrate a real sense of purpose in all aspects of business. Written by Marjolein Baghuis (@mbaghuis) for Change in Context. To read future book reviews and blog posts about sustainability, leadership and change, please subscribe in the sidebar.